Yesterday we went to Tony La Russa’s Animal Rescue Foundation (ARF) in Walnut Creek after work and were blown away. It’s my dream realized! While I was in middle and high school I volunteered at our local humane society. It was nice but I always hated that some animals were euthanized if they were not adopted in time. It was then that I vowed to start my own no-kill humane society one day. That’s what ARF is! They go into local shelters and humane societies and take what people call “24 hour animals.” In retrospect, I can’t believe that all their animals are 24 hours animals (24 hours until they are euthanized). Their cats and dogs are so cute and friendly and wonderful potential companions. At ARF, I was amazed by the facilities, service, quality of care, and so much more. It was like an animal resort! All their animals were extremely well taken care of and each “animal habitat” had state of the art toys. 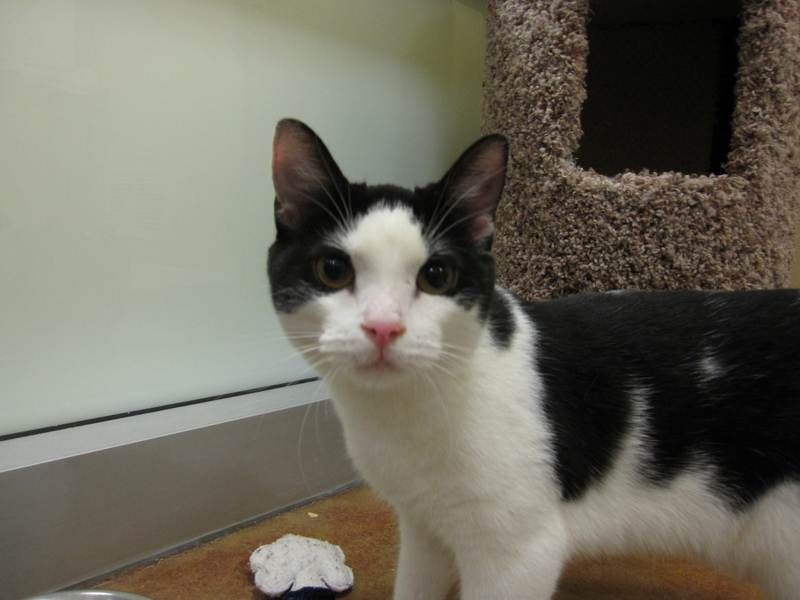 However, as I walked through the hallways of the cat rooms, I became worried that we would not find a fitting kitty. All the cats were a bit bigger than we had wanted or long haired and considering Allan’s allergies, that would not do. Finally, we reached the last row. I didn’t expect much and was prepared to go home and start researching more facilities. 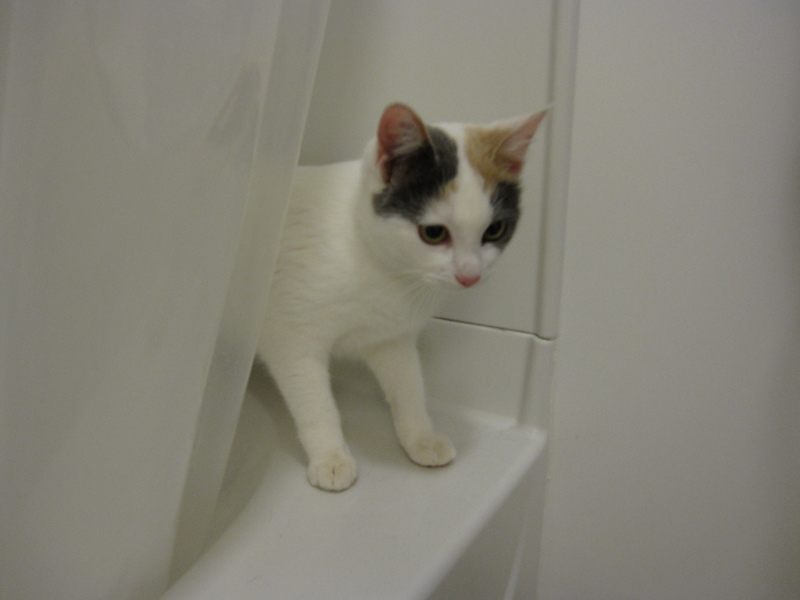 However, the second to last kitty was a cute small calico that I thought might be a good match. I didn’t want to decide on a cat before seeing the rest of the cats so I moved on to the last kitty. 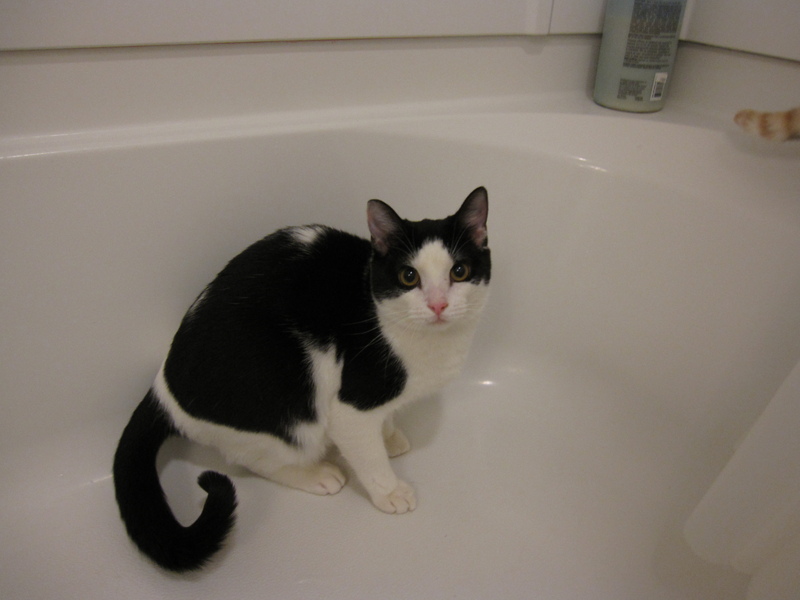 The last kitty was playful and outgoing and reminded me a little bit of Kimchi, the epitome of a perfect cat in my eyes. I turned to tell Allan but he was already on his knees, fawning over the little calico I had passed. I told him to come over and look at the last cat but he stubbornly refused and sat playing with Frauline. 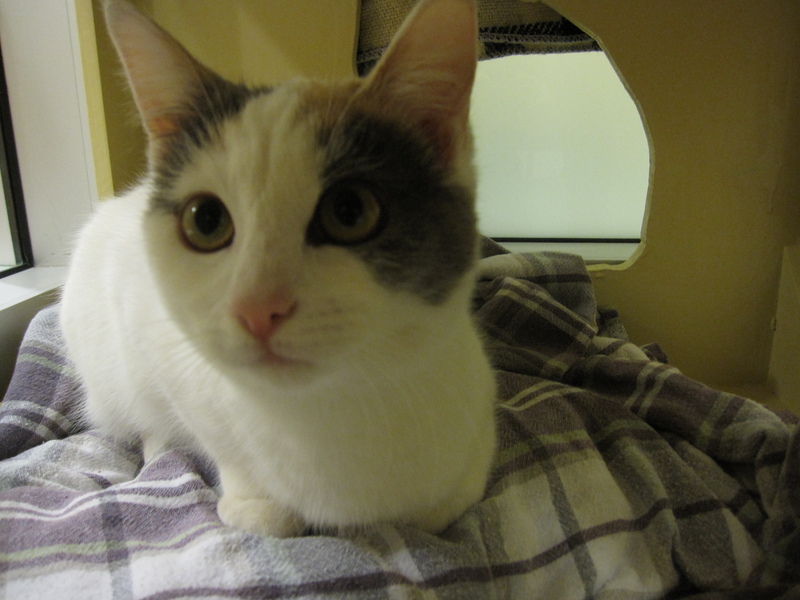 I, on the other hand, wanted to meet both Frauline and Jacqueline (the last kitty) before deciding on one. I also wanted to meet another one I had seen named Anya but after five minutes of playing with Frauline, Allan announced, “I’m going to take her home.” He had only seen her through a glass door but he already decided that she was the one. It’s funny how things work out. For the last four years I had been the one wheedling for a cat and Allan was the voice of reason, bringing up legitimate concerns like how it was against the rules to have a cat in my building, how I didn’t know where I would be going the next year, etc. but suddenly in a swift five minutes, we had switched roles. I was the one telling him to take it slower and think about it before making a hasty decision. But I guess it was just meant to be. 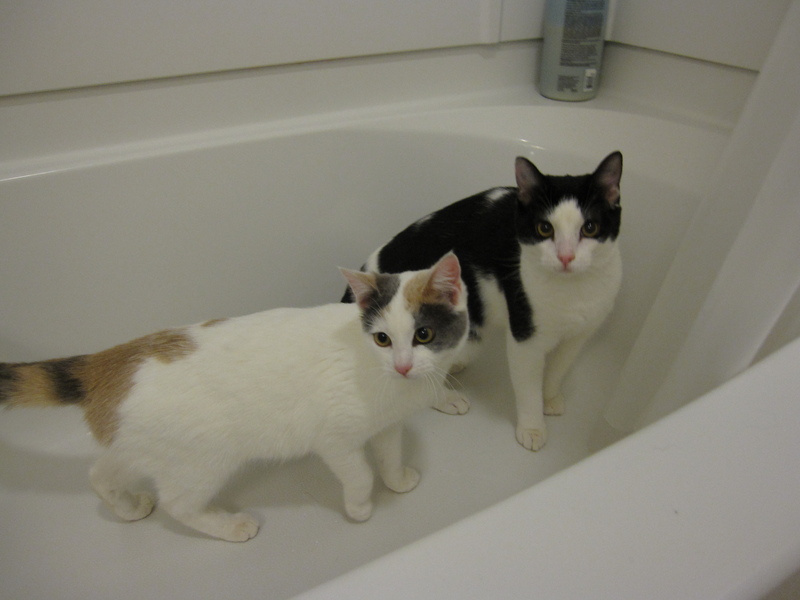 Before making a final decision, we introduced the kitties to each other to make sure that they would get along. And although there was a little hissing and batting, they left each other alone for the most part. It wasn’t too serious so we took them home that day. I started writing this the day we got them but because I wanted to remember all the details, I am completing this story three days since the adoption. So much has happened since then and I know for a fact that my blog will be filled with kitty posts in the future. To give you an update, we renamed the cats (the aforementioned names were temporary ones that the foundation had assigned them) to Neytiri and Navi. Neytiri really looks like Neytiri from the movie Avatar and so that name was a no brainer. However, we considered everything from Xiao long bao, Xiao Mei, Mei Mei, and Nabi for what eventually became Navi. Allan wanted give the kitty formerly known as Frauline an Asian name (because he thinks she looks Asian) but we finally decided on Navi. It sounds like butterfly in Korean (Nabi) but is in line with the Avatar theme. Navi is the smaller, shy one and Neytiri is the big, inquisitive one. When they first entered the apartment, Navi constantly hid in the smallest spaces she could find while Neytiri clambered on anything and everything she could reach. 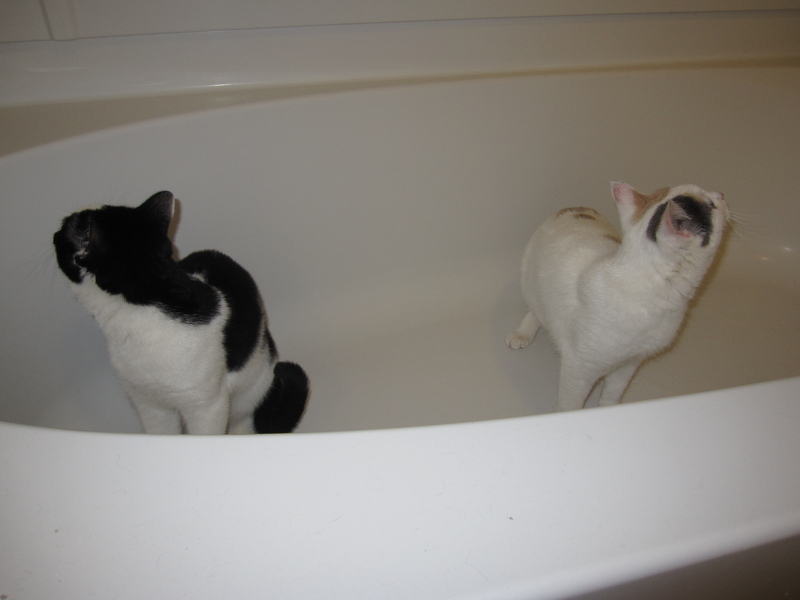 The funniest part of their homecoming was when I opened their boxes and they both jumped right into the bathtub. Neytiri loves licking water from steel faucets. At first I was a little concerned because both of them didn’t really like being touched or held but now that they’re more comfortable with their surroundings they have become a lot better. I do have some training to do, as Neytiri is in the habit of hissing and slightly scratching when she’s surprised. Their personalities have already changed so much (for the better) in the last few days so I’m really excited to see the transformation once they learn to trust us. They’re already so sweet and playful though that I’m fine if they just stay the way they are. Allan and I spoil them rotten with toys and treats but I know that will have to stop soon (we seriously feed them 20 treats a day, it’s ridiculous). Allan is on Cloud 9. He gets to say things like, “all my girls are waiting for me” (-_-) and has so much fun throwing balls around for the cats to chase. Someday I have to get him to write his version of the adoption story. He insists that Navi chose him and that both of the kitties were meant to be ours. Great pictures, and best of luck to you and your new fur-kid. Thank you for adopting from a shelter. You do know having cats means that you’ll be responsible for them for 10+ years. You are currently reading Kitty Story at You, Me, and Everyone Else.